First thing you notice on a Wyoming antelope hunt is that the wind never stops blowing. Next is a species of cactus which is almost indiscernible—until you are on your hands and knees crawling over half-inch spines that seemingly grow right out of the ground. But we crawled and crawled anyway, until we finally peeked over the horizon at a dandy antelope munching grass, totally unaware of our presence. We had first picked out the goat from 2 miles away. A long drive around and an approach from the other side had brought us considerably closer. But that still left a few hundred yards of rolling hills and valleys to traverse, until we crawled up the final knob to get Jim King in range for a 250-yard shot. We were hunting with Kelly Glause, owner of Cole Creek Outfitters. Jim had won the hunt, a hunt for two, in a raffle sponsored by the Wyoming tourism people. He invited me along, and I loaned him a rifle for the hunt, a Remington 700 Titanium, which I also would use when I continued on to hunt deer elsewhere. I had taken my antelope the previous afternoon with a T/C Encore pistol in 7mm-08. Jim’s rifle was chambered in .260 Remington and topped with a Cabela’s Alaskan 4-12x scope in Weaver 4x4 mounts. Lower magnification may be better for deer and elk, based on the need for a wider field of view. But quick, close shots almost never happen on an antelope hunt. The forend was supported by a Harris bipod. The load was a 120-grain Nosler Ballistic Tip ahead of a top load of IMR 4064 powder. The combination printed half-inch groups at 100 yards, sighted to be right on at 200 yards. My Encore was topped with a Burris 3-12X pistol scope, also in Weaver mounts. It shot 120-grain Sierra bullets ahead of Accurate Arms 2520 powder at 2,700 feet a second. Shooting with a benchrest-size Harris bipod, I could hold shots under MOA accuracy. Jim eased the rifle out in front of him, centered the scope on the antelope’s chest, swung the cross hairs just a bit into the wind, and squeezed the trigger. The goat fell right there. I’m not sure how many antelope are shot off-hand, but my guess is it’s few. Sure, some hunters pop over a knob and surprise an antelope in easy shooting range, but that is the exception that makes the rule. These critters live by their eyesight, and they display very little curiosity. As soon as they detect you, they take off at a gallop. No, the great majority of antelope are taken at a distance, with careful shots placed from at least some kind of a rest. During our first discussion, the outfitter Kelly stated that he could usually get a hunter to within 200 yards of an antelope, but that the ability to shoot farther would be an advantage. Some folks are happy to just drop to the ground and shoot prone, but a rest for the forend of the rifle is a distinct advantage. And best is an attached bipod, such as a Harris. The pivoting model is the flagship of their line. These bipods clip securely to the front swivel stud and have their own sling attachment point. They snap forward for carry and pivot downward for use. The legs extend, doubling or tripling the shooting height. Extended height ranges from the 9 inches of the Benchrest model (ideal for handguns) up to a 28-inch model that can be used comfortably from the sitting position. Set their swiveling model on uneven ground and the rifle easily pivots upright. Tension on the pivot should be set tight enough to eliminate any wobble, yet allow this pivoting. You may find less expensive knock-off copies, but the Harris is the original, and the others offer no advantages. 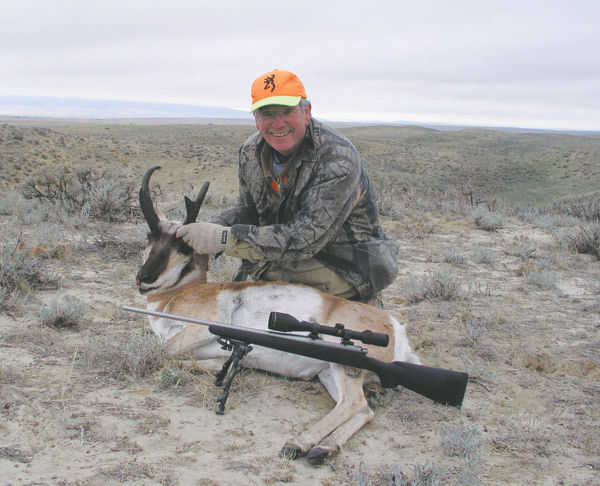 Spring, if not earlier, is the time to plan a Western antelope hunt, not only to apply for licenses and arrange outfitters, but also to have the summer to prepare the firearm and then practice with it. Westerners who hunt antelope in their home states may pass on shot after shot, knowing they can expect more of the same next weekend, and we seemed to be in the antelope capitol of the world, outside of Casper, Wyoming. There were antelope everywhere. It was more a matter of hunting for the best one as opposed to just hunting for one. Still, a hunter who has traveled a thousand miles at considerable expense, and has but a few days to hunt, is best served by a rifle that is set up to shoot accurately at long range. While any rifle that is adequate for deer is also adequate for the smaller antelope, cast a critical eye before taking your favorite deer rifle on a Western hunt. It should be readily apparent to any experienced rifleman that a .35 Remington is likely not a good choice out on the open prairie. If your heart is set on taking an antelope with a .35 Remington or a .45-70, it can be done. After all, many antelope are ambushed at watering holes and taken with bows and arrows. But you should discuss this with your guide before heading west for an outfitted hunt. Then there’s the question of how much gun is too much gun. You really don’t need a .300 Winchester Magnum to kill an antelope (or an elk, for that matter). But if you can shoot consistent 1-inch groups with the flat-shooting magnum, I suppose it is likely quite acceptable. Two of my hunting friends came to me last fall with problems sighting in rifles. One was shooting a new .270, the other a new .270 Short Magnum. Each said his rifle sprayed shots into 8-inch groups at 100 yards. Both rifles shot fine for me. If I had to venture a guess as to the percentage of hunters who shoot potent magnums as accurately as they shoot, say, a .223, it would be under 50 percent. And I’d add that 10 percent flinch so badly I can’t understand how they ever manage to sight in the rifle, let alone put a bullet in the right place on game. Maybe it’s a good thing the kill zone on an elk is larger than a bushel basket, for that’s about as well as many of these flinchers shoot their magnums. The evening after opening day of the New York 2007 rifle season, I received a phone call from a smaller-framed friend in his 80s who had experienced an interesting if disappointing day of hunting. He had missed a buck first thing in the morning. Assuming the scope was off, he had gone home and traded the .270 for a .30-06. He had missed another buck that afternoon. He was calling because he was convinced the rifles were off and he wanted me to sight in both rifles the next day. Instead, I told him to bring the rifles over, and I fired them both that evening, shining a light on the target. Both were sighted in perfectly. When he returns from Florida this spring, we’re going to discuss a new, lightweight rifle that he can hold more easily, one chambered for a cartridge with negligible recoil, likely a .243 or maybe a .260. Antelope, and deer for that matter, succumb very nicely to smaller big-game cartridges, and the .243 is readily given the nod by most outfitters. Why shoot a more potent cartridge that might make you flinch and pull the shot? With that in mind, what, exactly, are we looking for in an antelope cartridge? Considering the likelihood of shots out to 300 yards, higher velocity and a nicely pointed bullet minimize the need to make much allowance for bullet drop. America’s favorite, the .30-06, may have but a 7-inch drop at 300 yards when zeroed at 200. Yet many hunters aren’t completely comfortable with .30-06 recoil, and when shooting small targets at 300 yards, any flinch becomes significant. It’s almost always better to hit game in the right place than to hit it harder in the wrong place. There is absolutely no need to hunt antelope with anything larger than a .270 Winchester. And even a .270 produces enough recoil to hamper the long-range accuracy of some hunters. If I had to pick the absolute best cartridge, it would be the .25-06, and not only for antelope, but also for open-country whitetails, as well. The .25 was once doubted as having too small a diameter to perform with unquestioned reliability on deer. But with today’s premium bullets, .25 and even .243 make my list for guaranteed performance. I chose the .260 for Jim because it has the powder capacity of the .243 with just a bit more bullet diameter and weight. Recoil is minimal, something especially important in such a lightweight titanium rifle. My long-range woodchuck rifle is a varmint-weight Savage .25-06, pushing a 100-grain Ballistic Tip at almost 3,400 ft/s. I also opt for that .25-06 when climbing into a deer stand that offers the possibility of long shots. The next thing to consider when setting up for long shots is wind drift. The wind always blows in Wyoming, and not gentle breezes. While your guide might offer to wait a day for conditions (hopefully) to improve, if you tell him that you’re prepared for a 200-yard shot in the wind, you’ll likely hunt that day. Why not come prepared for the possibility? A 150-grain flat-nosed bullet from a .30-30 will likely drift 40 inches at 200 yards in a 20 mph crosswind. But a pointy bullet of the same weight from the same rifle will drift perhaps 16 inches. Put that same bullet in a .308 at magnum velocity (3,300 ft/s) and it drifts just 13.4 inches. A .270, shooting a pointy 130-grainer, drifts 15 inches at the same 200 yards under the same 20 mph crosswind. A pointy 100-grain bullet from a .25-06 will drift 14 inches, while a 117-grain will drift just a bit less, 13.4 inches. All of these cartridges require some degree of “Kentucky windage” on the part of the shooter, and it is surprisingly difficult to guesstimate wind velocity. Practice with a wind meter (I like the Wind Wizard by Caldwell), to improve your ability to make that estimation. Even if you know the ballistics and get the wind speed right, the wind may be blowing one way where you stand and a different way out where the target waits. Expert target shooters use many wind flags for a reason. The advice for most shots at big game in wind is “Don’t hold off-hair,” meaning that you hold a bit to the upwind side, but only so much that if the wind doesn’t affect the shot, it still will be a lethal hit. Hornady and Barnes list wind deflection in their reloading manuals. RCBS reloading software also makes wind calculations. I use Sierra’s computer program, Infinity Suite, for all of my bullet drop and wind information, first printing their chart for a particular load then printing a smaller version to tape to the bell of the riflescope so that I can quickly check to see how high to hold and how much wind drift to expect at various distances. Even if you don’t reload, ballistics books and programs can be quite useful. And, yes, a laser range finder is pretty handy out West, too. It’s also wise to practice shooting the rifle and load out to the farthest range you might take a shot on game, and to do it under the widest range of wind and weather conditions possible. A shorter barrel on your hunting rifle may not let the load match the published velocity. And unrealistic velocity claims for factory loads (they seem more realistic in recent years) can also leave you with more bullet drop than expected. Each summer, a few friends and I set up tall targets in an open field then practice shots out to ranges well beyond what we might ever shoot at game, just to see how good we really are. Knowing that we may be breathing heavily from a walk, and adding a bit of shake from seeing a trophy animal, keeps us conservative. When hunting antelope out West, there will likely be no mountains to climb, but being in shape for a long hike, or crawl, is also helpful. I’m still not sure what to do about those spiny cacti.